If nothing else, we can always say that the weather is interesting here in Kentucky. Last week it was 4 degrees one morning, yesterday and today in the 50's and then tonight it is supposed to be in the single digits again. Standing at my kitchen window this morning, I noticed the activity around the bird feeders could only be described as frantic. Somehow the birds always seem to know when the weather is going to change drastically. The ice on the koi pond is almost gone now, but will be back again tomorrow. The sheep are standing out in the field, rather stoically with their backsides to the wind and rain. I would so much rather this moisture come in the form of snow. Slipping and sliding around in the rain while putting out the sheep feed and hay is one of the worst farm chores, as far as I'm concerned. Everything and everyone stays so much cleaner when the ground is frozen. When I open the gate for the ewes to come into the grain feeding area, there is always a mad scramble and I usually end up soggy from being up against their fleeces as they rush by. About this time of year I start really looking at those fleeces and wondering what sort of shape they are going to be in at shearing. The shearer will be coming in about a month, so that I can get their fleeces off before lambing starts. I know--it sounds cruel to shear them when it is cold, but it is better for all concerned. The fleeces are very clean so far, because the ewes have not been in the barn (and therefore, not sleeping in the straw and pulling hay out of the feeders onto themselves and everyone around them). Also, without their fleeces it is much easier for me to analyze their physical condition and, most importantly, if they are getting ready to go into labor. The lambs will drop down to get into position and this causes the ewe to hollow out in the flank area. With 5-6 inches of wool covering, it sometimes doesn't show. The actual delivery process is much cleaner without all that wool and it is much easier for the lambs to find the milk bag. Once the ewes are shorn, they will be kept in the barn, where it is much warmer, until they have grown a little wool back to insulate themselves. 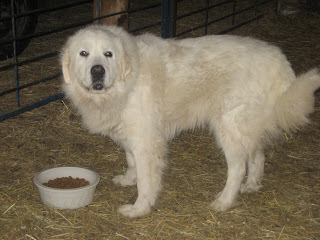 There have been some rumblings of thunder off and on today, which explains why the Great Pyrenees have not been seen. Two of the three are terrified of storms and head for the barn at the first sign a storm is coming. Abby, who 10 years old now, is the most traumatized. She finds something to get under inside the barn and stays there until it is over. Buddy, who is 9 years old, has only been with us a few months and he is also nervous when it is stormy. Only Hannah, our youngster at 5 years seems oblivious, which is strangely surprising because she is more weird about other things than any Pyr I have ever known. One of the constants on the farm is awareness of the weather. I have friends living in town who are able to go from house to attached garage to parking garage without ever actually being exposed to the weather. Living on the farm with livestock to care for means being out in it every day. Most days I find that a good thing---not so sure about today! My first post! I've been thinking about doing this for some time now, but have felt intimidated by all I do not know about the process. I finally decided I would never learn if I didn't just get over myself and start. It is cold today and we got about an inch of snow during the night. Right now the temperature is just above freezing, so we are getting drizzly rain on top of the snow. Messy, sloppy time doing barn chores and feeding the ewes this morning. I only have 24 ewes right now and that seems enough (or maybe even more than enough). They all were marked by the ram during breeding and should all be pregnant. (The ram wears a harness with a crayon attached to it so that when he mounts a ewe, it puts a mark on her rump.) Lambing will start late in March and I have mixed emotions about that. I did not breed any ewes the last two years, mainly because I was not on the farm during most days and didn't want to risk finding disasters when I got home in the evenings. I have to admit that not having lambs made keeping sheep much, much easier. But then, I do so love to watch those baby lambs. One of my favorite things to do is just sit down in the straw in the middle of the pen and wait for the lambs to get curious enough to come over and check me out. My ewe flock is comprised of Romney, Bluefaced Leicester, and crossbreds of the two. I love the fleeces on the crossbreds best of all and that is the reason for not raising purebreds anymore. There was a time when I only raised purebreds and did the hard work of showing at fairs and wool festivals. In order to sell breeding stock, you have to get in the show ring and do well. I was successful at showing, but I don't really have the competitive nature to enjoy it. So, I now have a handspinner's flock and we all stay home on the farm. This year I used a black Romney-Bluefaced Leicester crossbred ram on all the ewes, so I'm anxious to see what he produced. On the knitting scene, I have way too many projects going to talk about all at once. I'm working on the Highland Triangle Shawl from "Folk Shawls" and finishing a simple roll neck pullover in some Jo Sharp Silkroad Aran Tweed and a crewneck pullover in Rowan Scottish Tweed Aran for my husband. There are several pairs of socks languishing and numerous scarves, hats, mittens---you name it, I've got it started! I confess to being a pattern junkie, so I have lots of other projects started in my head. So little time!